The Glass Mosaica Civili Gaul makes for an excellent addition to your home. 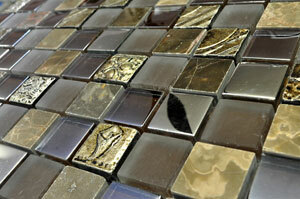 It is a striking mosaic tile which consists of various stone and glass pieces to create a decorative look. The Glass Mosaica Civili Gaul tile is available in a standard size of 300x300mm and is sold per piece. It is an indoor wall tile which is suitable for use in kitchens, bathrooms, laundry spaces and also in creating wall borders. This mosaic offers a distinctive look which is worthy of attention. It includes a mix of gold and glass blocks in a random pattern, which creates an attractive visual effect. It will do very well to complement a range of classic and contemporary décor. 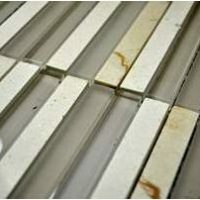 This tile has been specially designed to offer the qualities of a superior product at an affordable price. And, thanks to high quality manufacturing, it is built to withstand the test of time. Rest assured that it will not lose its surface finish or good looks with time. For a striking decorative mosaic tile in Perth, you’ll find nothing better than the Glass Mosaica Civili Gaul at Ross’s Discount Home Centre. Buy this distinctive tile at a great price from our online store today!